V Nanammal -- The Grand Old Lady of Yoga -- is the oldest recipient of the Padma Shri this year. 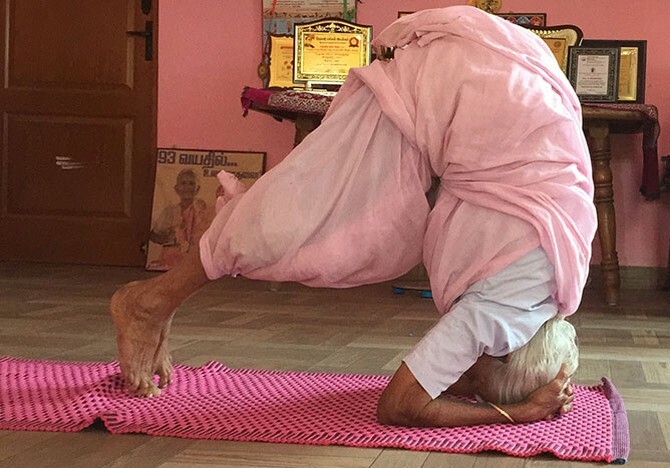 Rediff.com's Archana Masih met the nearly 100-year-old yoga guru who does not wear glasses, has never been to a doctor and can do age defying twists, hauls and bends. In a pink cotton sari, chandan covering most of her forehead, India's oldest yoga guru makes her way to a room full of trophies and certificates. Soon, another honour will be added to the collection -- the Padma Shri, which was announced on the eve of Republic Day for her service to yoga. 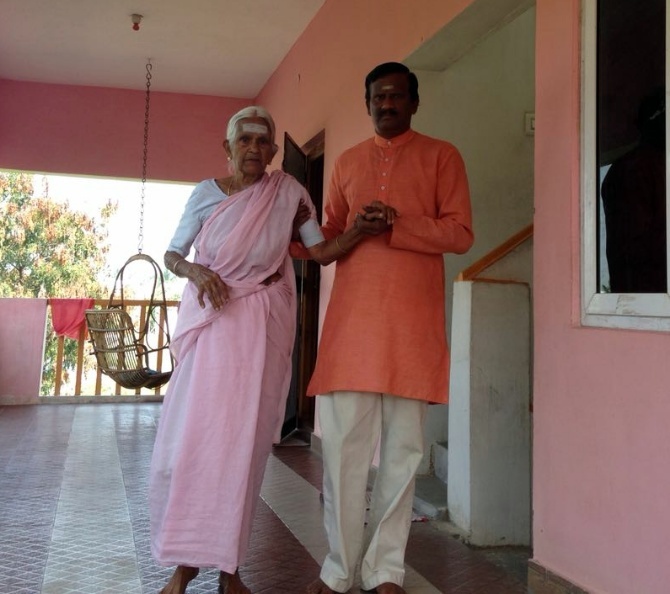 At 97, V Nanammal, is thin and walks straight. She can bend and twist, but what is most striking about her is the shine in her eyes and the grace to her smile. There is also a simplicity about her approach to yoga. A rootedness. Everything in the room is simple. She settles on a cloth carpet spread out on the floor. Tucks her sari, says a small prayer with folded hands and gets down to doing two of her favourite asanas. There was a time she did 50 asanas every day, now she does 10 -- every day, without fail. Yoga is the first thing she has done every morning for as long as she can remember. Her advice is simple -- just as you brush your teeth and have a bath daily, do yoga, the same way. 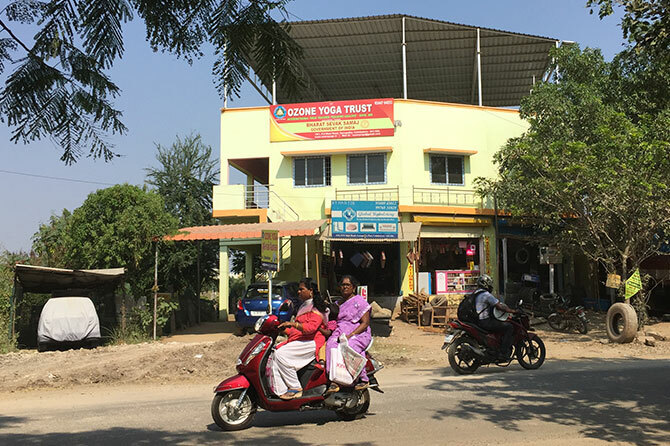 It is also a tradition she has passed on -- 36 members of her family teach yoga and 10,000 yoga instructors have learnt yoga under her tutelage at the Ozone Yoga institute in Coimbatore. A Sri Lankan lady who took the instructor's course teaches the family of Matripala Sirisena, the country's president, says her son, Yoga Master V Balakrishnan. "Just like the ATM machine, any time is good time for yoga," he laughs and says he started doing yoga aged 11. WATCH the Yoga Grandmother do two asanas she does everyday. She had done asanas 8 times for journalists who had come to meet her in the two days after the government announced the Padma Shri for her. 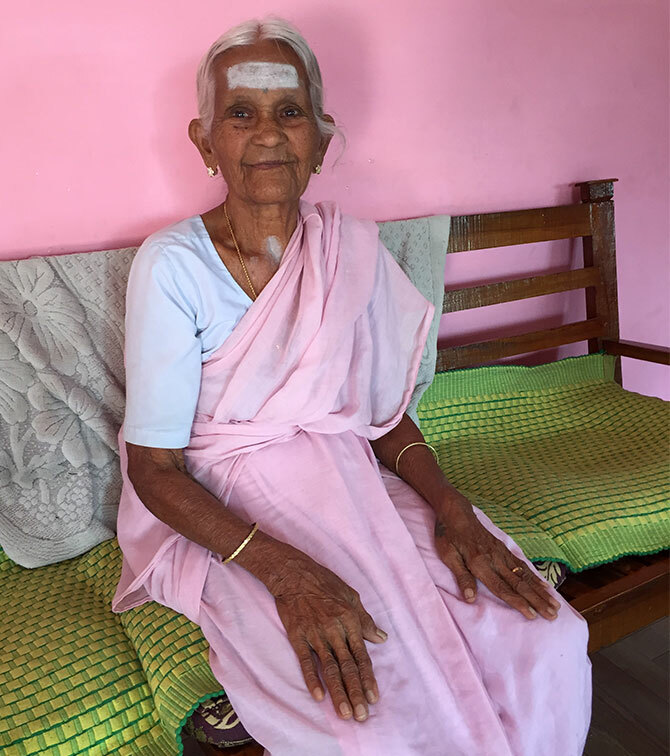 This yoga mother, grandmother, great grandmother has never been to a doctor or hospital. She has never worn glasses. Never had hypertension or diabetes. Never broken a bone. Or lost memory. She does not use white sugar, only jaggery. When she slipped on the staircase to her first floor home in Coimbatore last year, she bruised her hip which still hurts. But she continues to take classes and go to schools for yoga demonstrations. "She never has tea or coffee, and only takes natural medication made of herbs. In fact, no one in our family drinks tea, coffee. We don't rely on English medicines either," says V Balakrishnan, whose wife Chitra, a national gold medallist in yoga, offers warm water mixed with honey. "Sip it, don't gulp it down," he points out. "My mother has 6 children, 12 grandchildren and 11 great grandchildren -- all of them have been normal deliveries. Isn't it unbelievable in today's times when 70% births are through c-section?" he says with pride. "It is only because of yoga." IMAGE: The great grandmother has never missed a day of yoga. Her smile is gorgeous, and her eyes twinkle bright. Every morning, the great grandmother wakes up between 4.30 am and 5 am and drinks three glasses of jeera water. Post ablutions, she does yoga, which she learnt from her grandparents, who were farm labourers. Breakfast is kanji water with green vegetables. Lunch is vegetable with rice or chapati. At tea time, it is either sugarcane or carrot juice. Dinner is before sunset and is mostly a glass of milk with turmeric or honey and some fruit. In the evening, she takes a yoga class, and goes to bed by 7.30 pm. It is a simple life, well lived and in sharing an Indian tradition is the secret to her wellbeing. "India is not a simple country. It is the number one country. Switzerland is beautiful, but does it have the wealth of herbs that we have? Our traditional knowledge of naturopathy, ayurveda, yoga is unmatched," points out Mr Balakrishnan. IMAGE: The Ozone Yoga Institute in Coimbatore has sent forth many yoga teachers into the world. 36 of V Nanammal's family members teach yoga. Since the news of the Padma Shri came in, Nanammal granny has been featured in several Coimbatore newspapers. Eight journalists have come by to report on her since January 26 and she has done yoga asanas for each one of them, Mr Balakrishnan, her eldest son and fourth child, tells me. In the room is a large poster of her receiving an award on International Women's Day from then President Pranab Mukherjee at Rashtrapati Bhavan last year. At a dinner the prime minister hosted for the awardees, she is standing next to Narendra D Modi. "When she goes to receive the Padma Shri, it will be the same place, only the President would have changed," says Mr Balakrishnan, a man of verve and good humour. "She does not make too much of it, but feels happy yoga is getting its due." The family says that the International Day of Yoga -- the brainchild of Prime Minister Modi -- has given yoga a big boost. It has enhanced the stature of yoga, drawn many people to it and has resulted in an increase in income for them. "Our total income has increased 5, 10 times. First, people used to say why are you asking money for yoga, now they pay willingly," says Mr Balakrishnan. The institute charges Rs 1,000 for each level of the course. IMAGE: With her son Yoga Master V Balakrishnan, who started doing yoga at age 11. He is now 59. Last year, the Karnataka government invited Yoga Guru Nanammal for the Yoga Day function. In her pink sari, she was on stage leading the asanas. Union Minister Ananth Kumar was also on stage doing yoga. It was at a yoga competition that Nanammal first got noticed. She had attended the gathering of practitioners and when the first prize was announced, she objected. The person who was being adjudged the winner had not done the asana correctly, she pointed out. The organisers wondered who this old woman was as she went up to show them the correct way of doing the asana. From then on she participated in many yoga competitions, some as far as the Andaman islands. The tables and shelves full of trophies are a testament to a lifetime's dedication to yoga. Now, one more award will join the trophies, the Padma Shri -- as the nation honours the Grand Old Lady of Yoga. On that tableful of trophies, perhaps it will mean the most for her.